An American Champion Scout. Note the oversized tundra tires, for use on rough surfaces. A bush airplane is a general aviation aircraft used to provide both scheduled and unscheduled passenger and flight services to remote, undeveloped areas, such as the Canadian north or bush, Alaskan tundra, the African bush, Amazon rainforest or the Australian Outback. They are used where ground transportation infrastructure is inadequate or does not exist. Since a bush plane is defined by how it is used, a wide variety of different aircraft with different configurations have been used over the years as such. However, experience has shown certain traits to be desirable, and so they appear frequently, especially on aircraft specifically designed as bush planes. None of these traits are mandatory - merely they are commonly seen features of bush planes. The undercarriage is designed to be fitted with floats, skis or wheel/skis to permit operation from water or snow which are primarily for Canadian, Alaskan and Russian use. High wings ease loading and unloading, particularly from docks, as well as improve downward visibility during flight and increase clearance to reduce the potential for damage during landing or take-off. A high wing is less likely to be damaged during loading or unloading than a low wing. Conventional or "tail dragger" landing gear—two large main wheels and a small rear wheel reduce both weight and drag, increasing the load the aircraft can carry and its speed and it reduces excessive stresses on the airframe compared to a nosewheel. A failure is also less critical as a broken tailwheel is easily repaired and won't prevent the aircraft from flying, unlike a broken nose wheel. Short runway requirements, typically gained through high aspect ratio wings and high-lift devices such as flaps, slots and slats to improve low speed flight characteristics, allowing shorter ground rolls on landing or takeoff. 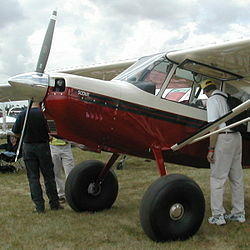 Very large, low-pressure tundra tires may be fitted to enable the pilot to operate from broken ground. It is not uncommon for a bush pilot to land and take off from unprepared surfaces. Years in brackets are of first flight. Ontario Provincial Air Service - played major role in the development of bush flying and bushplanes. ^ "Bush planes used in areas where roads do not exist". ^ Foster, 1990, p.101-102, 158, 166, 188. Anderson, Frank W.; Downs, Art (2004). The Death of Albert Johnson - Mad Trapper of Rat River. Surrey, BC: Heritage House Publishing Co. ISBN 1-894384-03-2. Boer, Peter (2004). Bush Pilots - Canada's Wilderness Daredevils. Canada: Folklore Publishing. ISBN 1-894864-12-3. Cole, Dermot (1986). Frank Barr - Bush pilot in Alaska and the Yukon. Edmonds, WA: Alaska Northwest Publishing Co. ISBN 0-88240-314-1. Foster, J.A. (1990). The Bush Pilots - A pictoral history of a Canadian phenomenon. Toronto, ON: McClelland & Stewart Inc. ISBN 0-7710-3245-5. Keith, Ronald A. (1972). Bush Pilot with a briefcase. Toronto, ON: Doubleday Canada. ISBN 0-385-07049-7. Matheson, Shirlee Smith (1994). Flying the Frontiers. Saskatoon, SK: Fifth House. ISBN 978-1895618518. Terpening, Rex (2006). Bent Props and Blow Pots - A Pioneer Remembers Northern Bush Flying. Madeira Park, BC: Harour Publishing. ISBN 1-55017-381-2. West, Bruce (1974). The Firebirds - How bush flying earned its wings. Ministry of Natural Resources (Ontario). ASIN B0089GQ3EE. Milberry, Larry (1985). Austin Airways - Canada's Oldest Airline. Toronto, ON: CANAV Books. ISBN 978-0969070337. Wikimedia Commons has media related to Bush planes.